The newest Intel processors i7 with the supporting Intel X58 chipset provide incredible gaming and computing performance. 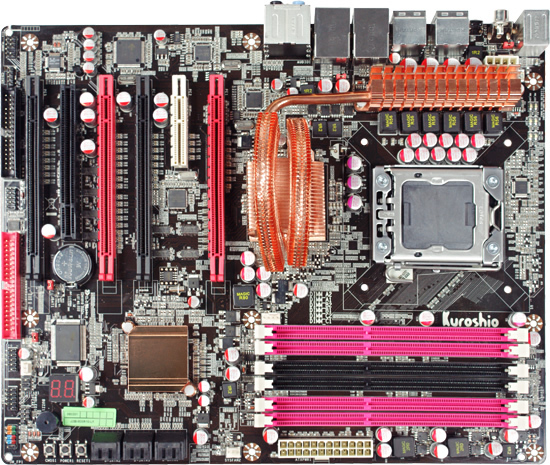 In recent months the market has been overflowing with many Intel X58 based motherboards from many different brands. Perhaps a not very well known company in the US, Jetway brings interesting budget products to the market. Having released many motherboard in the past Jetway takes on a new challenge in Intel’s X58 chipset. For review here we have Jetway Kuroshio BI-600, sometimes known as JBI-600-LF. We will take a look at its layout, its performance and overall pros and cons. Conquer the world of extreme gaming with the fastest performing processor on the planet: the Intel® Core™ i7 processor Extreme Edition.¹With faster, intelligent multi-core technology that accelerates performance to match your workload, it delivers an incredible breakthrough in gaming performance. But performance doesn’t stop at gaming. You’ll multitask 25 percent faster and unleash incredible digital media creation with up to 79 percent faster video encoding and up to 46 percent faster image rendering, plus incredible performance for photo retouching and editing. In fact, you’ll experience maximum performance for whatever you do, thanks to the combination of Intel® Turbo Boost technology² and Intel® Hyper-Threading technology (Intel® HT technology)³, which activates full processing power exactly where and when you need it most. Desktop PC platforms based on the Intel® X58 Express Chipset, combined with the Intel® Core™ i7 processor family, drive breakthrough performance and state-of-the-art technology to performance and mainstream platforms. The Intel X58 Express Chipset supports the latest 45nm Intel Core i7 processor family at 6.4 GT/s and 4.8 GT/s speeds via the Intel® QuickPath Interconnect (Intel® QPI). Additionally, this chipset delivers dual x16 or quad x8 PCI Express* 2.0 graphics card support, and support for Intel® High Performance Solid State Drives on ICH10 and ICH10R consumer SKUs. The PCI Express 2.0 x16 graphics delivers up to 8 GB/s per direction, 2 times more bandwidth than PCI Express x16 and up to 16 GB/s concurrent bandwidth. PCI-Express x1 I/O offers 1GB/s concurrently, over 7 times more bandwidth than AGP8X, tackling the most demanding multimedia tasks nowadays. This platform supports reliable storage solution for enhanced data protection and data accessing performance. Serial ATA 3Gb/s is firstly introduced in this platform to provide blazingly 3Gb/s bus bandwidth thus higher disk performance. The adjustable voltage for CPU Vcore 31 stages can be upgraded in 64 stages for the precisely hardware dynamic over-clocking of demanding computing performance. To ensure working stability, BI-B00 applies the up-1-down-2 current loop design. Power supply module with lots of high-quality electrolytic capacitors and Mosfets guarantees sufficient electrical power.The board adopts the 6+2 phase power design for the processor. 6 of the phases function as the main provider for processor power supply, they switch on and off by turns periodically, providing i7 with stable and sufficient power while the other 2 phases exclusively power for CPU QPI and memory controller. Ferrite Choke and low ESR MOSFET guarantee low temperature, high stability and extraordinary power-saving effects.BI-600 utilizes 6 phases for CPU power supply, each phase consists of 3 MOSFET + Fujitsu CPAE Capacitors+ MAGIC R56 totally-enclosed inductance. 2 phases for Uncore power supply.